Continue Reading "Invisible Low-Hanging Fruit"
Posted by Jay Arthur in Improvement Insights, Jay Arthur Blog. Continue Reading "It’s Just Human Error"
Posted by Jay Arthur in Improvement Insights. Continue Reading "Find the CEO of the Problem"
Continue Reading "Kaizen Muda Gemba"
Continue Reading "The Headwinds of History in Quality"
Still practicing last century quality improvement? The economy has changed. Current trends demand an Agile approach to Six Sigma. Isn’t it time to embrace 21st Century Quality? Continue Reading "Trends Facing Lean Six Sigma"
QI Macros exhibited at the Institute for Healthcare Improvement (IHI) conference in Orlando this week. There were over 500 improvement posters. Like prior years, I used a checksheet to collect data about the tools used. Once again, the results are disappointing. Quality tools–control charts, Pareto charts, and Fishbone diagrams–are still a small percentage of tools used, unchanged since I started collecting data in 2015. Bar and line charts still dominate posters; I call them Dumb and Dumber charts. The quest for Zero Harm using high-reliability methods and tools (i.e., Lean Six Sigma, control charts, Pareto charts, histograms, etc.) is gaining momentum. 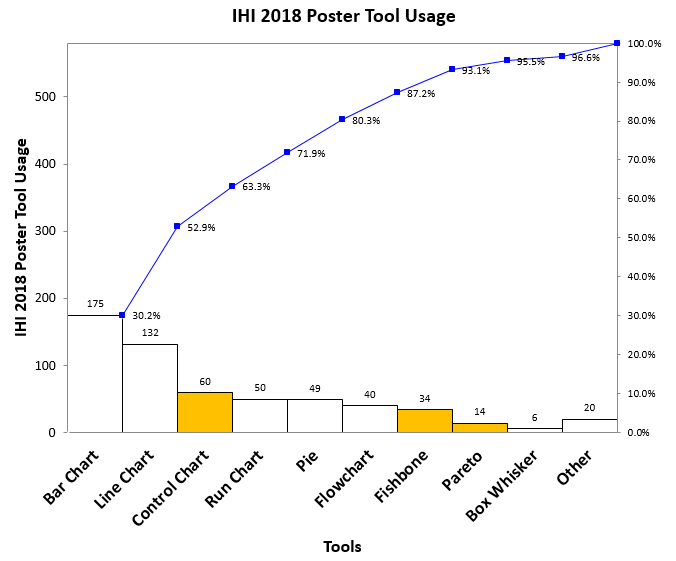 Continue Reading "IHI Quality Tool Usage in Poster Presentations"
Posted by Jay Arthur in Improvement Insights, QI Macros, Six Sigma. Continue Reading "20th vs 21st Century Quality"
Posted by Jay Arthur in Data Mining, Improvement Insights, QI Macros, Six Sigma, Statistics. 20th Century Quality needed big Six Sigma implementations because you had to learn things that aren’t necessary any more. Take a 21st Century, Agile approach to Six Sigma to start getting results immediately. Continue Reading "Don’t Implement Six Sigma"
Who Sets Your Specification Limits? A QI Macros customer called to ask how he could figure out the specification limits to give him a Cp/Cpk of 1.33. What’s wrong with this question? The answer is obvious isn’t it? Continue Reading "Who Sets Your Specification Limits?"